The picture on today's Mail Online website says it all. 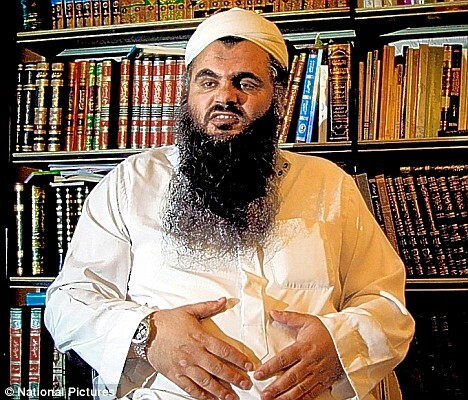 Abu Qatada, wanted by Jordan for involvement in terrorist attacks, strolls down a London street, carrying groceries paid for by the British taxpayer. Beside him, on a mobile phone, apparently acting as a go-between, is Yasser Al-Sirri, wanted by Egypt for aiding an assassination attempt in 1993 of the then Prime Minister with a car bomb, which instead killed a young girl. Both these men despise the country that is sheltering them. To Qatada, it is the duty of Muslims to kill non-Muslims. Al-Sirri refers to the 'impotence and criminal nature' of the British government. Well, he's right about the impotence. The decent people of this country want hate-mongers like these thrown out, but the Government seems powerless. Between the human rights industry and a judiciary that appears more concerned about perpetrators than victims, foreign extremists are a protected species. In the case of Qatada, the immigration authorities, the police, the security services, the judiciary and the politicians have been almost criminal in their failure to deal with a ruthless fanatic. Abu Qatada arrived here in 1993 on a forged passport. This did not bother the immigration service, who accepted his claim that he would be tortured if he went home to Jordan so they gave him and his wife and five children asylum. Why? Did no one run a check on him? There was ample evidence of his extremism but no one bothered to look for it. Supported by state benefits, Qatada began preaching in local mosques his blood-thirsty anti-Jewish and anti-Christian messages and calling for Muslims to kill non-Muslims. Because of a toxic mixture of political correctness and ignorance that seems to pervade all our dealings with Muslim extremists, the police were ignoring the rants of even the most incendiary preachers, so Qatada spread his poison undisturbed. If any more evidence were required as to Qatada's evil intent, then it came in 2000. Jordan sentenced him in his absence to life imprisonment for his part in a plot to murder tourists. They demanded his extradition but it was not until February 2001 that the antiterrorist branch even got round to raiding his house. They found £170,000 in various currencies including £805 in an envelope labelled for 'the Mujahedin in Chechnya'. Incredibly, nothing happened, because the appeasement of Islamic extremists had become part of the police mindset. It took 9/11 to get the authorities to take Islamic terrorism seriously. The German police found 19 audio cassettes of Qatada's sermons in a flat used by the leading suicide pilot, Mohammed Atta, and Qatada was put under surveillance by MI5. Signs of action? Not really, they lost him for nine months. When he was found and arrested under new anti-terrorist laws in October 2002 he still wasn't charged with anything. At least this time he was held in prison. Over the next few years, an immigration appeals committee ruled that he could be kept in jail, but the Law Lords ordered his release. By now the Government wanted to deport him, but Qatada's lawyers (paid for by the taxpayer, of course) used New Labour's own Human Rights legislation to challenge the Government. The judiciary refuses to send anyone to a country where there is a possibility of torture or a death penalty - no matter what danger they pose to the innocent people of this country. So when in February 2007 Qatada lost his appeal at the Special Immigration Appeals Commission, the Court of Appeal blocked his deportation on the grounds that he might face a trial in which evidence against him could have been extracted by torture. The fact that Qatada advocates the utmost brutality against non-Muslims appears to have had no influence on the courts. Not content with their decision that such a man should be allowed to stay into this country, Qatada was even given bail. The conditions included a ban on having a mobile phone, on communicating with a long list of people including Osama Bin Laden and on having any unapproved visitors during the 22 hours he has to spend at home. So he got round that by having a friend with a phone relaying messages for him. And what a friend! Why was Yasser Al-Sirri not on the banned list? He, after all, was a leading figure in Islamic Jihad, a group that tried to overthrow Egypt's government by force and replace it with an Islamic state. Having lived in Yemen and visited Sudan, where he allegedly met Bin Laden's number two, he decided to go to London, by now the foreign terrorist capital of the world. In 1994, the year in which he was sentenced to death in Egypt, he arrived in the UK with a false passport and was granted asylum. The authorities have been equally hopeless in Al-Sirri's case, although he has worked closely with known Islamist extremists, including the appalling Abu Hamza, who was allowed to preach his filth for years until pressure from the United States led to his arrest and conviction for incitement to murder and stirring up racial hatred. Islamic extremists are not noted for their sense of humour, but they must hoot with laughter at the idiocy of the United Kingdom. The system does not just allow people in who hate the country, but it subsidises them, turns a blind eye to their activities until forced to act, foots the bill for lawyers to find loopholes in laws that were designed to keep the public safe, and has judges who take such lofty absolutist positions that it is almost impossible to deport even the vilest of the vile. If Islamic terrorists and their supporters were looking for a safe haven during the so-called 'war against terror', why on earth would they bother with some dusty cave in Afghanistan, a squalid street in Iran or a dangerous suburb of Baghdad? Britain is far more comfortable and generous towards them. And - even more attractive - they run no risk. They are allowed to carry on with their plans for our destruction unfettered by the rule of law or fears of justice. Jacqui Smith, the Home Secretary, has appealed to the House of Lords to reverse the Qatada decision and hopes that eventually she will be allowed to kick him out. Is it too much to hope that in the meantime his bail conditions are revisited, and that for good measure he is charged with incitement to murder and racial hatred? Never mind his ludicrous bail conditions, the only conditions suitable for him are a jail cell as he awaits deportation. Ordinary people keep wondering whatever happened to good old British common sense. Would any sane person believe that hundreds of thousands of pounds of our money should be spent on defending the so-called human rights of a creature like Qatada - a man who supports the indiscriminate slaughter of civilians in Algeria and calls for a holy war in Afghanistan where British troops are fighting? To the person in the street, it is obvious that asylum should be available only to bona fide refugees. How did we end up with a system where every organ of the state seems to be part of a conspiracy to protect undesirables from being given their just desserts? The saddest aspect of the scandal of the British approach to foreign terrorists is that it is the very decency of this country that people like Qatada use against it. People who advocate murder flourish in the human rights culture and they believe themselves above the law. In that London street, with his shady companion helping him flout the bail laws, Qatada is putting two fingers up to British justice.